297 is recognized for stylish interpretations and body renewal. Guests come to 297 because of the experience. The whole package: from the front desk to the training of our Licensed Professionals, our culture is built to make a lasting impression – every single guest, every single time. 297 has built a reputation for our innovative approach to education. We base our prices on individual experience and education level within the 297 career path. We feel confident in recommending all of our team members, regardless of title. As an Aveda Concept Salon, we are committed to excellence in beauty, fashion, and wellness. We use Aveda hair, skin, and body care products for our services. Organic, renewable, and sustainable, the green ingredients in Aveda products replenish the body and the environment.  Design, creativity, and body renewal: 297 is THE destination for relaxation, rejuvenation, and expression of personal style.